Let’s face it: no one is exempt from having a bad day. They often come when you least expect it, throwing off your momentum and messing up all your perfect plans and good intentions. A coffee spill in your morning meeting – yes, on your white shirt! Some days may be trying, but it’s OK – you’re not the only one. Bad days happen to everyone! But what sets the best entrepreneurs apart from the rest is their consistency; their ability to pick themselves up, dust themselves down and carry on as if nothing had happened – like a pro. Consistency is one of the key success factors in any business. It is keeping your eyes on the prize and not allowing external circumstances to slow you down or influence your progress. It is showing your real character in good or bad times. In his book, The Compound Effect (which I can highly recommend), Darren Hardy explains that he will beat anyone at anything because he has the self-discipline to be consistent. And you can do the same. Remember, quitters never win and winners never quit! But it doesn’t always seem that simple when it feels like the sky is falling down around you. Sometimes, the best way to turn bad days around is to start thinking outward. Count your blessings, they say. Think of acts of kindness shown to you. Remember your past achievements. Celebrate the small victories. Being grateful improves optimism and will help you through the bad times. Start a gratitude diary so you are never caught out. Before you go to sleep, write in it three things that you are grateful for each day. Science has proven that meditation reduces stress. And many experts believe that meditation improves long-term focus that allows you to deal with bad situations better. For two minutes, you can clear your head by sitting in your favourite chair. Relax your body. Start deep-breathing. You can also listen to soothing music or ambient sounds to induce the feeling of quiet. This will give you the mind-space you need to solve your current dilemma, put your bad day behind you and determine what positive step to take next. One mishap may lead you to doubt your direction. Are you taking the right path? Have you got the right strategy? Do you really have the right skills? The best way to get out of this cloud is getting back to the drawing board. Ask yourself, ‘How am I feeling right now?’ Then, follow up with ‘Where do I want to be?’ Perhaps your current situation is telling you that you’ve moved off course and that you need to tweak your plans if you are to reach your goal. Revisit your why, goals and vision board and instead of doubting yourself, take action by brainstorming ways to get from A to B.
Don’t let a bad day ruin the rest of your hard work. Write down your successes in a journal, there is a special magic in committing your thoughts to paper. Read it whenever you need to remind yourself of bad days you’ve overcome. If you don’t have such journal yet, it’s time to create one. Take a break from the usual by focusing on something completely different, such as your favourite hobby. Enjoy baking? Making a tray of chocolate cupcakes will soothe your spirit. Into gardening? Let nature inspire you with its beauty. Indulging in your hobbies will cheer you up and help you refocus on what’s important. Have you ever seen a child playing dress-up? As soon as they put their fancy dress costume on, they take on a whole new character. You can do the same. When everything is going wrong, instead of letting the events get you down, put on the outfit that makes you feel the most confident, do your hair and make-up and go out. Even if it’s just to the local coffee shop with a good book, or better still an inspiring self-development book, you’ll soon see your determination settle back in. If you’re down, a good way to lift your spirit is to find comfort in your trusted circle. They could be your friends and family. Talk to them about your recent disappointments and allow them to fill you with words of encouragement. Knowing you’re not alone helps you get back on your feet. But take care not to confide in that Moaning Minnie or Negative Nora (you know you know them! ), find someone who is a good listener or someone who always makes you feel good about yourself. Looking for a support group? Join the Facebook community, Your Business Success. Here, you can meet like-minded entrepreneurs and get insider tips to grow your business. When you feel upset or angry, the best solution is to get moving. Taking a walk washes away those strong feelings. You get a change of atmosphere. When your emotions quiet down, you can think more clearly, enabling you to solve problems more easily. Sleeping helps you reset your system. A 20-minute power nap will help you beat the effects of stress caused by a bad day. It will also improve your alertness, creativity, and motor function. And, as you wake up, you feel more refreshed and ready to seize the day. Understanding what you can do to handle the stress that comes with bad days, will help you stay on track during the often unpredictable entrepreneurial journey. What also helps is being well-equipped with the right entrepreneurial tools and mindset to stay consistent and motivated. My eCourse 8 Steps to Your Business Success is designed to help new entrepreneurs do just that. 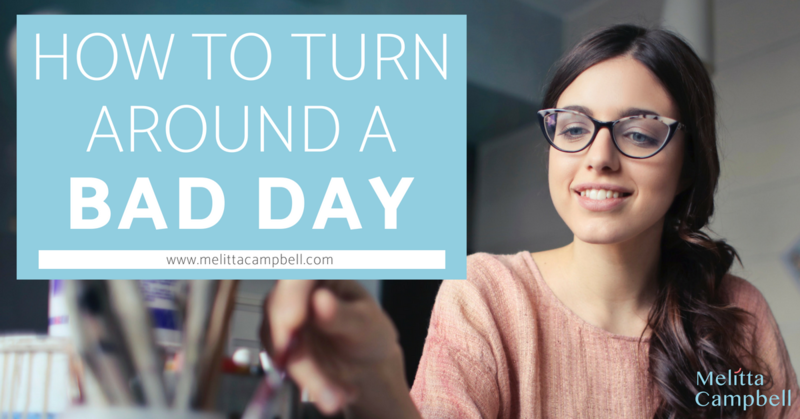 It will guide you in creating a solid foundation for your business, develop the right mindset, and create the environment for success – reducing the likelihood of bad days! I love the idea of starting a success journal. I think that would keep me in the present, accepting what is, and being thankful for what has been accomplished or gone well. Great tips! Yes, it’s a great tool – and you can use it anyway you like. Let me know how you get on! I love the idea of a success journal! I never thought of this and I think it could really work for me! I also love the idea of taking a nap…but every time I try I just can’t fall asleep! Maybe I could try meditating instead. I hear such great things about it but never really tried to get into it. Thanks for sharing your tips! Success journals are a great way to recognize your achievements and, when times get tough, it can really help to remind yourself of all the other tough times you’ve got through and conquered. Keep me posted on how you get on with that. And I’m with you on the falling asleep thing. I did a 30 meditation challenge once and failed miserably – but I did have my most well-rested month in ages lol. Since then I’ve discovered the app ‘Mindspace’ and love it, you can choose a topic that’s relevant to you at that moment and you can choose to just do a really short meditation if you like. Though meditation takes many different forms, for many people it can be a walk in nature, or a jog. Thanks for sharing your experiences, I’m glad you enjoyed the tips. Thanks Anj, glad you found it helpful! That’s exactly it – see if there’s a lesson to learn, learn it, then let it go and move on.